View More In Home Energy Efficiency. 101 Rules of Thumb sets out the essential elements of low energy architecture in a fresh, intuitive way. In an area where ever-changing technology and complex legislation and can cloud the designer’s thought-processes, this book encourages the designer to think clearly and intuitively about the fundamentals of low energy buildings. With reliable, simple rules of thumb that will provide new ideas and refresh the designer’s palette, each page focuses on a single piece of advice or guidance along with a clear hand-drawn illustration, while there are also plenty of tips and more detailed information for those who wish to dig deeper. The emphasis is on passive low-energy principles, and the rules of thumb cover all the design fundamentals from site and location to orientation and form, peppered with some which will help the designer to think ‘outside the box’ about the design process itself. 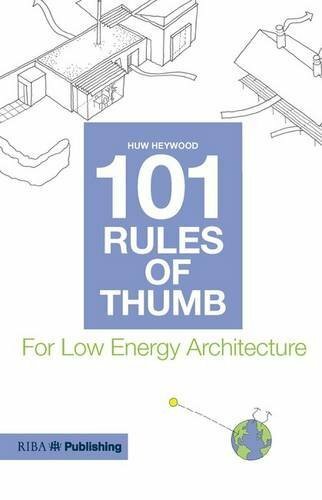 Applicable throughout the world in any climate region, 101 Rules of Thumb is a global primer intended to be dipped into at any time as a quick means of re-focusing on what’s important when designing a new or retro-fitted low energy building.